The genus Pseudomonas is a group of ubiquitous Gram-negative rod shaped bacterium mostly present in soil, and water surfaces. Pseudomonas infections are related with high morbidity and mortality , and common species isolated from clinical specimen is Pseudomonas aeruginosa . However, Pseudomonas fluorescens (P. fluorescens) is a member of the fluorescent pseudomonas group and mostly regarded to be of low virulence and an infrequent human infection . P. fluorescens is a heterogeneous species that can be subdivided by various taxonomic criteria into several biotypes . Complete genome sequence was reported in two strains, namely P. fluorescens Pf-5 genome consist of 87 RNAs and 6137 proteins, and P. fluorescens PfO-1 genome consist of 95 RNAs and 5736 proteins [5,6]. Lyophilization or freeze drying is the most widely used storage methods for drying bacteria or other biological materials. It may be considered as a two-stage process of freezing and drying. Freezing has been extensively used in case of cells and tissues , which can be convenient for the survival of microorganisms. Even sensitive microorganism showed satisfactory recoveries, if proper care must be taken with respect to temperature control, suspending media, and rate of cooling . On the other hand, drying is also more advisable storage condition for sensitive microorganism. Above methods involved removal of moisture from a frozen solution or suspension in a high vacuum, but few exceptions in case of nonviable materials, especially proteins and tissues. This approach has been extensively used for different substance in past 40 years by numerous investigators [9,10]. Although, alterations in microbes cannot be happened in lyophilized state without any strong energy transmission. In order to evaluate the impact of Mr. Trivedi’s biofield treatment on lyophilized strain, study was designed to investigate the alteration in antibiogram pattern and its related parameters. Mr. Trivedi has the ability to harness the energy from the environment or Universe and transmit this energy into any object (living or nonliving) on the Globe. The objects always receive the energy and responding into useful way that is knows biofield energy. This process is termed as biofield treatment. Mr. Trivedi’s unique biofield treatment is also known as The Trivedi Effect®. Biofield, the electromagnetic field that surrounds the living organism will provides regulatory and communication functions within the organism. Mr. Trivedi’s biofield energy treatment was extensively studied in material science [11-13], agricultural science [14-16], in biotechnology . It is reported in altering the susceptibility of antimicrobials of pathogenic microbes [18-20] and reduced the viral load in hepatitis C virus . After consideration of clinical significance of P. fluorescens and significant impact of biofield treatment on microbes, a detailed investigation was studied to evaluate the impact of biofield treatment on P. fluorescens. Treatment was assessed in relation to antimicrobials susceptibility, biotyping based on various biochemical reactions. Further, genotyping of this organism was performed using 16S rDNA sequencing method. Lyophilized sample of Pseudomonas fluorescens [American Type Culture Collection (ATCC) 49838] was procured from MicroBioLogics, Inc., USA, and stored as per suggested storage conditions until further use. The acceptability of the identification media and antimicrobial agents were checked prior to the study by ATCC organisms. The antimicrobial susceptibility, biochemical reactions, and biotype number were evaluated on MicroScan Walk-Away® (Dade Behring Inc., West Sacramento, CA) using Negative Breakpoint Combo 30 (NBPC30) panel. The NBPC30 panel was stored at 2 to -25°C. The panels were allowed to equilibrate to room temperature prior to rehydration. All opened panels were used in same day. The 16S rDNA sequencing study was carried out using Ultrapure Genomic DNA Prep Kit; Cat KT 83 (Bangalore Genei, India). The turbidity standard technique using direct inoculation of revived and lyophilized P. fluorescens was used. Using a sterile wooden applicator stick or bacteriological loop, the surface of 4-5 large or 5-10 small morphologically similar culture was touched for well-isolated colonies from an 18-24 hour non-inhibitory agar plate. Further, colonies were emulsified in 3 mL of inoculum water (autoclaved deionized water) to an equivalent of a 0.5 McFarland barium sulfate turbidity standard. 100 μL of the standardized suspension was pipetted into 25 mL of inoculum water using pluronic and inverted 8-10 times. Group I: No treatment was given. Revived from lyophilized state and considered as control. It was analyzed for antimicrobial sensitivity, minimum inhibitory concentration (MIC), biochemical reactions and biotype number as per the standard protocol. Group II: This group was divided into two separate sub parts named as Gr. IIA and Gr. IIB. Group IIA: P. fluorescens sample was subjected to the Mr. Trivedi’s biofield treatment for the first time in the lyophilized state itself and then revived. After treatment, the analysis was done on day 10 for antimicrobial sensitivity, MIC, biochemical reactions and biotype number as per the standard protocols. Further, 16S rDNA sequencing study was carried out in treated sample to study the genotypic alteration in organism. Group IIB: It included the sample which was analyzed in Gr. IIA. P. fluorescens strain was stored for 159 days at -70°C, so that no contamination would take place till they were revived again. Gr. IIB was further subdivided in two groups named as Gr. IIB, study I and Gr. IIB, study II. Group IIB-Study I: After 159 days, antimicrobial sensitivity, MIC, biochemical reactions and biotyping were performed as per the standard protocol. Group IIB-Study II: The stored strain was revived from -70°C and the revived culture was again subjected to Mr. Trivedi’s biofield energy treatment (re-treatment) on day 159. After biofield retreatment, the sample was sub-cultured into three separate tubes on 3 different days (Day 0, Day 5 and Day 10) and was analyzed keeping the main treated tube aside. Each sample was analyzed after 5 days of its sub-culturing. The lyophilized (Gr. IIA) sample of P. fluorescens was subjected to biofield treatment followed by retreatment after storing for 159 days in revived state (Gr. IIB, study II). The treatment group in sealed pack was handed over to Mr. Trivedi for biofield treatment under laboratory condition. Mr. Trivedi provided the treatment through his energy transmission process to the treated groups without touching the samples. Treated samples were assessed for antimicrobial sensitivity, biochemical reactions, and biotyping as per experimental design. Whilst handing over these cultures to Mr. Trivedi for retreatment purposes, optimum precautions were taken to avoid contamination. The 16S rDNA gene sequencing of P. fluorescens was also carried out to confirm the identity of sample after biofield treatment . Antimicrobial sensitivity pattern of P. fluorescens in each group was carried out with the help of automated instrument, MicroScan Walk-Away® using NBPC30 panel, as per the manufacturer’s instructions . MIC and the qualitative susceptibility pattern like resistant (R), intermediate (I), or susceptible (S), were determined by observing the lowest antimicrobial concentration showing growth inhibition. 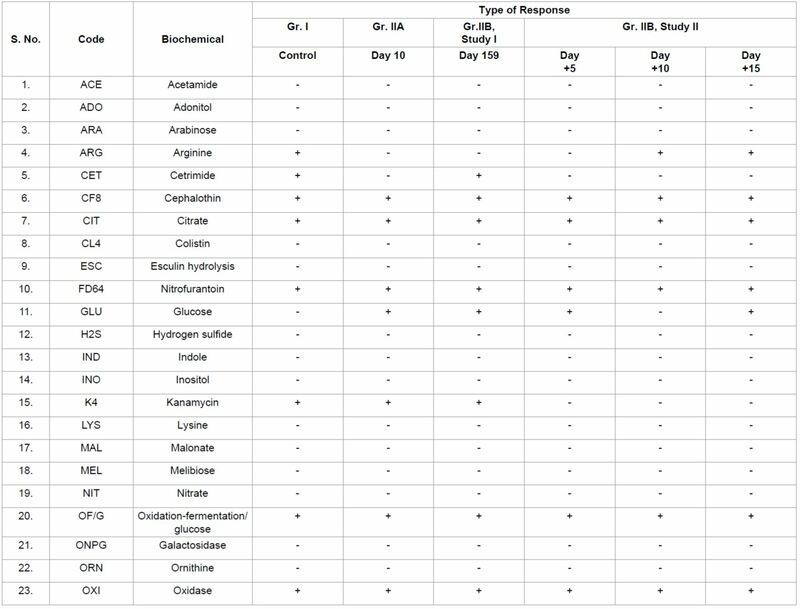 All these antimicrobials used in this study were purchased from Sigma-Aldrich, USA. The biochemical studies of P. fluorescens were performed on MicroScan Walk-Away® . Biochemical reactions pattern were carried out in all the tested group using 33 biochemicals viz. acetamide, adonitol, arabinose, arginine, cetrimide, cephalothin, citrate, colistin, esculin hydrolysis, nitrofurantoin, glucose, hydrogen sulfide, indole, inositol, kanamycin, lysine, malonate, melibiose, nitrate, oxidation-fermentation/glucose, galactosidase, ornithine, oxidase, penicillin, raffinose, rhamnose, sorbitol, sucrose, tartrate, tryptophan deaminase, tobramycin, urea, and Voges-Proskauer. All these biochemicals used in this experiment were procured from Sigma-Aldrich, USA. The biotype number of P. fluorescens was determined by automated MicroScan Walk-Away® processed panel data utilizing biochemical reactions . Genomic DNA was isolated and purified from treated group of P. fluorescens cells by using genomic purification Kit, as per the manufacturer’s instructions. The PCR product was bi-directionally sequenced using the forward, reverse and an internal primer. DNA 16S region amplification was performed using the primer set 16SF–16SR . The 16S rDNA gene (~1.5 kb) was amplified employing universal primers (16SF 5ˊ-AGAGTTTGATCCTGGCTCAG-3ˊ; 16SR 5ˊ-CTACGGCTACCTTGTTACGA-3ˊ). Amplification was carried out in a Rapid Cycler thermo controller, with initial denaturation, annealing and extension temperature. Following amplification, products were analyzed by gel electrophoresis at 100 V (in 1.0% agarose gel, 0.2 µg of ethidium bromide mL-1) in tris-acetate buffer (TAE), and visualized under UV light in a gel documentation unit (BioRad Laboratories, USA). The amplified fragment of PCR was purified from the agarose gel by DNA Gel Extraction Kit. Sequencing of amplified product was carried out on commercial basis from Bangalore Genei, India. The obtained 16S rDNA sequences data were aligned and compared with the sequences, available in GenBank database of National Center for Biotechnology Information (NCBI) using the algorithm BLASTn program. The multiple sequence alignment/phylogenetic tree were constructed using MEGA 3.1 software using neighbor joining method . The results of antimicrobial sensitivity after biofield treatment on P. fluorescens are summarized in Table 1. Biofield treated cells of P. fluorescens showed alteration in sensitivity pattern of aztreonam, cefepime, Cefotaxime, ciprofloxacin, Piperacillin, and tetracycline. Biofield treatment in lyophilized state of P. fluorescens showed improved sensitivity in case of tetracycline i.e., from intermediate to susceptible in Gr. IIA, on day 10 as compared to its control. Rest of the tested antimicrobials did not show any alteration in Gr. IIA, on day 10 with respect of control. All the antimicrobials were again tested on Gr. IIB, study I sample and results showed alteration in two antimicrobials i.e., Cefepime and Cefotaxime. Cefepime showed improved sensitivity i.e., from intermediate to susceptible, while sensitivity of Cefotaxime was changed from intermediate to resistant (Gr. IIB, study I) as compared to control (Gr. I). only tetracycline showed changed sensitivity (i.e., S→I) in Gr. IIB, study I (day 159) as compared to analysis done on day 10 (Gr. IIA). However, results showed that most of the tested antimicrobials (except cefepime and Cefotaxime) showed sustained sensitivity profile on storage of treated P. fluorescens strain for 159 days as compared to control. Further study II (Gr. IIB) results showed alteration in sensitivity pattern of tested antimicrobials after biofield retreatment in revived state of P. fluorescens, and compared with control. Results showed that sensitivity was improved in case of aztreonam and Cefotaxime antibiotics i.e., from resistant to intermediate on day 10 (Gr. IIB, study II) after retreatment compared with Gr. IIB, study I. Cefotaxime showed altered sensitivity pattern from intermediate to resistant on day 5 and 15 (Gr. IIB, study II) as compared to control. Ciprofloxacin showed altered sensitivity from susceptible to intermediate on day 15 (Gr. IIB, study II) after retreatment as compared to control. Piperacillin sensitivity was also altered from susceptible to intermediate on day 5 and day 15 (Gr. IIB, study II) with respect to control. 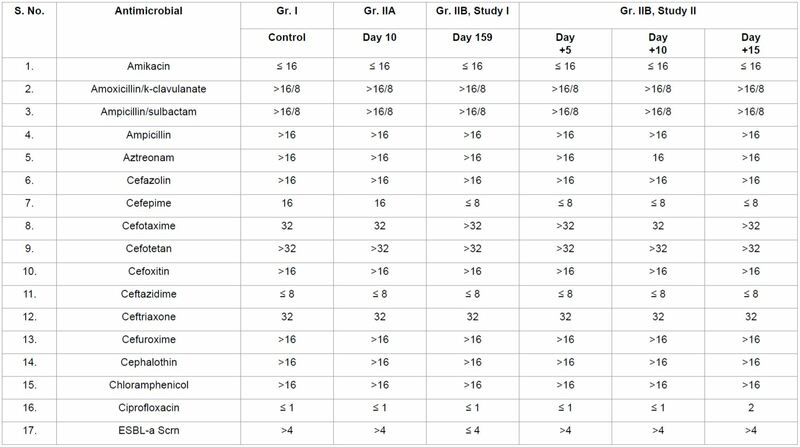 Tetracycline sensitivity was improved i.e., from intermediate to susceptible on day 10 (Gr. IIB, study II) as compared to control (Gr. I). Rest of antimicrobials such as Amikacin, Ceftazidime, ceftriaxone, chloramphenicol, gentamicin, Imipenem, levofloxacin, Meropenem, Piperacillin/tazobactam, Ticarcillin/k-clavulanate, tobramycin, and trimethoprim/sulfamethoxazole did not show any alteration after treatment in lyophilized or revived state with respect to control. Biofield treatment in lyophilized and retreatment in revived P. fluorescens showed alteration in MIC values of antimicrobials with respect to control. MIC values are summarized in Table 2. Tetracycline showed two-folds decrease in MIC (8 µg/mL to ≤ 4 µg/mL) value in Gr. IIA, day 10, i.e., after biofield treatment in lyophilized state with respect to control (Gr. I). To study the sustained effect of biofield treatment on MIC values, analysis was done after 159 days (Gr. IIB, study I). Results showed that antimicrobials such as cefepime showed two-folds decreased MIC i.e., 16 µg/mL to ≤ 8 µg/mL. Beside, altered MIC value was also reported in ESBL-a Scrn (>4 µg/mL to ≤ 4 µg/mL), ESBL-b Scrn (>1 µg/mL to ≤ 1 µg/mL), Cefotaxime (32 µg/mL to >32 µg/mL), and Norfloxacin (≤ 4 µg/mL to 8 µg/mL) as compared to control (Gr. I). Gr. IIB, study II, results showed altered MIC values in ten antimicrobials out of thirty-two tested. Decreased value of MIC was reported in case of aztreonam (>16 µg/mL to 16 µg/mL), while two-folds decreased MIC in moxifloxacin (4 µg/mL to ≤ 2 µg/mL), tetracycline (8 µg/mL to ≤ 4 µg/mL) on day 10 (Gr. IIB, study II) as compared to control (Gr. I). Cefotaxime showed altered MIC (32 µg/mL to >32 µg/mL) on day 5 and 15, as compared to control (Gr. I). Norfloxacin (≤ 4 µg/mL to 8 µg/mL) showed two-folds decreased MIC on day 5 and 10, as compared to Gr. IIB, study I. Ciprofloxacin, Gatifloxacin and Norfloxacin showed increased MIC values on day 15 (Gr. IIB, study II) compared to control, while MIC value of moxifloxacin and Piperacillin was altered on day 5, and 15 as compared to control. Rest of the antimicrobials did not show any alteration in MIC value, after treatment in any group with respect to control. The biochemical reactions of P. fluorescens are reported in Table 3. After biofield treatment, 12.12% alteration in biochemical reactions was reported. Arginine and cetrimide showed negative reactions (i.e., positive (+) to negative (-)), while glucose showed positive reaction (i.e., negative (-) to positive (+)) in Gr. IIA, day 10 as compared to control (Gr. I). Further, to check the sustained effect on tested biochemicals, analysis was performed on day 159, and the results showed alteration in cetrimide i.e., again positive reaction on day 159 (Gr. IIB, study I), as compared to results of day 10 (Gr. IIA). However, cetrimide and kanamycin showed negative reaction after retreatment in revived state on day 5, 10, and 15 (Gr. IIB, study II) as compared to control. Arginine showed negative reaction on day 5, while glucose showed positive reaction on day 5 and 15 as compared to control (Gr. I). Rest of the twenty-nine biochemical did not show any alteration in reaction pattern with respect to control. The biotype number of P. fluorescens was determined on MicroScan Walk-Away® processed panel, using biochemical reactions data. Biotype numbers with organism identification are summarized in Table 4. The result showed an alteration in biotype number (4000 0043) in Gr. IIA, day 10 and in Gr. IIB, studies II, day 10 with identified organism as Vibrio fluvialis as compared to control. Further results showed an alteration of biotype numbers 4000 0043/0004 0022, with altered species as Vibrio fluvialis/Pseudomonas spp., as compared to control. After retreatment results showed alteration in biotype number on day 5, 10 and 15 in Gr. IIB, study II as compared to control. Biofield treatment showed altered biotype numbers i.e., 4000 0043, 0204 0622, and 4000 2043 observed on day 5, 10, and 15 respectively in Gr. IIB, study II with respect to control. Altered microorganism was found on day 15 as Vibrio fluvialis with respect to control (Gr. I). Table 1: Effect of biofield treatment on antimicrobial susceptibility of Pseudomonas fluorescens. R: Resistant; I: Intermediate; S: Susceptible; Gr. 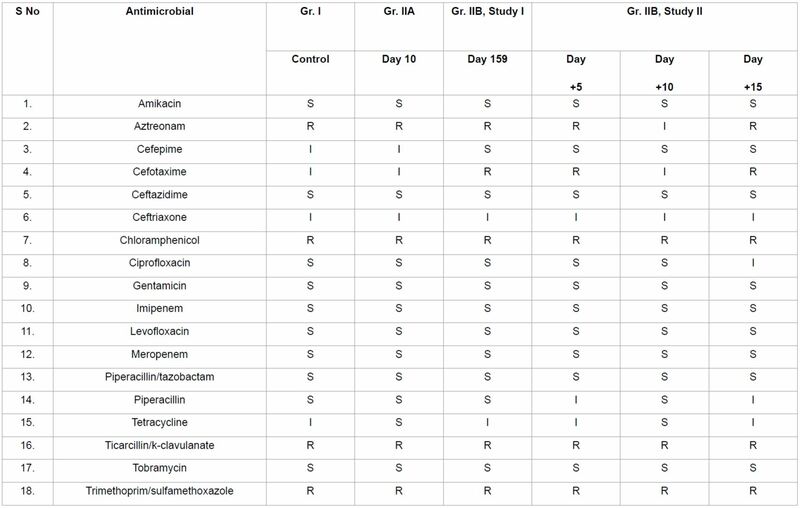 : Group; Antimicrobial susceptibility pattern in control and treated groups were evaluated using automated Micro Scan Walk-Away® system using NBPC30 panel. Table 2: Minimum inhibitory concentration (MIC) of tested antimicrobials against Pseudomonas fluorescens. MIC values are presented in µg/mL; Gr. : Group; ESBL-a, b Scrn: Extended spectrum beta-lactamase a, b Screen; MIC values in control and treated groups were evaluated using automated Micro Scan Walk-Away® system using NBPC30 panel. Table 3: Effect of biofield treatment on biochemical reactions of Pseudomonas fluorescens. -: negative; +: positive; Gr. : Group; Biochemical reactions in control and treated groups were evaluated using automated MicroScan Walk-Away® system using NBPC30 panel. Table 4: Effect of biofield treatment on biotype number of Pseudomonas fluorescens. Biotype numbers and organism identification in control and treated groups were evaluated using automated MicroScan Walk-Away® system using NBPC30 panel. In order to confirm the PCR-based identification results, 16S rDNA sequence analysis was performed in biofield treated lyophilized P. fluorescens strain. The alignment and assessment of the gene sequences data were performed by comparing with the sequences available in GenBank database of NCBI, using the algorithm BLASTn program. The phylogenetic tree was constituted using BLAST-Webpage (NCBI). 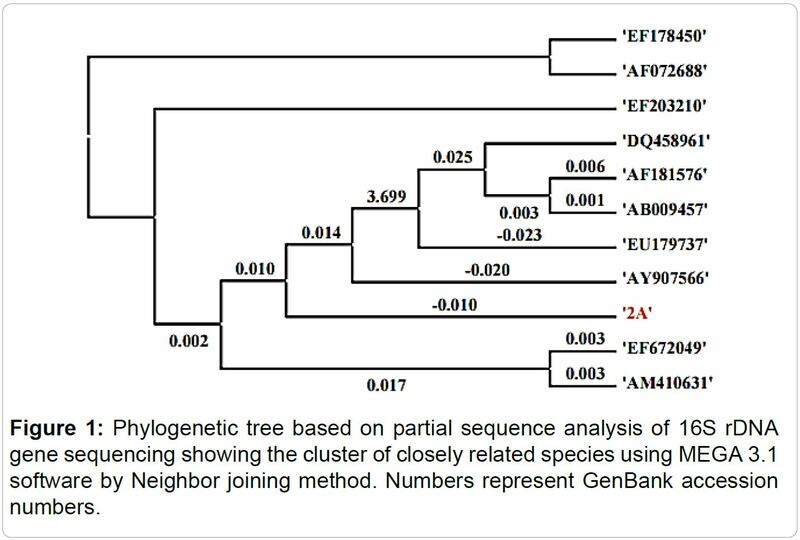 Based on nucleotides homology and phylogenetic analysis the Microbe (Sample 2A) was detected to be Pseudomonas entomophila (GenBank Accession Number: AY907566) with 96% identity of gene sequencing data. Ten closely related bacterial species and P. fluorescens were considered as Operational Taxonomic Units (OTUs) in order to investigate the phylogenetic relationship of P. fluorescens among other ten related species (Figure 1). Total 1482 base nucleotide of 16S rDNA gene sequences were analyzed by multiple alignments using ClustalW of MEGA3.1 program . Based on the phylogenetic tree and 16S rDNA sequencing, the nearest homolog genus-species was found to be Pseudomonas fluorescens (Accession No. EF672049). Other closely related homologs of P. fluorescens can be found from the sequence alignment as shown in Table 5. Distance matrix between the 16S-rDNA sequences of 11 pathogens was analyzed based on nucleotide sequence homology using Kimura-2 Parameter. According to the data in Table 6, the lowest value of genetic distance from sample 2A was 0.003 base substitutions per site. Total 11 sequences of base substitutions per site from pairwise distance analysis were shown in Table 6.
quick emergence of resistant via various natural mechanisms. However, biofield treatment on microbes has been reported as an alternate approach to improve the susceptibility pattern of antimicrobial up to a great extent. Table 5: The closest sequences of Pseudomonas fluorescens from sequence alignment using NCBI GenBank and ribosomal database project (RDP). AN: GenBank Accession Number. Alignment results and sequence description has been obtained from the blast results of GenBank database of National Center for Biotechnology Information (NCBI) using the algorithm BLASTn program. Table 6: Distance matrix between the 16S rDNA sequences of 11 pathogens based on nucleotide sequence homology (Using Kimura-2 Parameter) of Pseudomonas fluorescens. AN: GenBank Accession Number. Total 1482 base nucleotide of 16S rDNA gene sequences were analyzed by multiple alignments using ClustalW program. Pairwise distance (lower left) and number of nucleotide difference (upper-right) for 16S forward and reverse primer was presented using Kimura-2 Parameters. negative organisms . Although, P. fluorescens is susceptible in all the groups against Amikacin before and after treatment, but found resistant against aztreonam in control (Gr. I). After biofield treatment in lyophilized as well as retreatment in revived state showed improved sensitivity pattern of aztreonam from resistant to intermediate. Also, MIC results were well supported (i.e., decreased MIC to 16 µg/mL) with improved sensitivity data as compared to control. Likewise, cefepime efficacy for the treatment of pneumonia in hospitalized patients against Pseudomonas infections was well reported [31,32]. The experimental results showed improve efficacy of cefepime in terms of sensitivity as well as MIC value (two-folds decrease) after biofield retreatment as compared to control. Biofield treatment on Pseudomonas might up-regulated the efflux membrane, or alter the function of inducible AmpC β-lactamase enzymes, which could results in altered sensitivity. Similarly, use of tetracycline against Pseudomonas infections has been well studied . Biofield treatment showed improved sensitivity as well as decreased MIC value of tetracycline. Moxifloxacin and extended spectrum beta lactamases (ESBL) showed improved susceptibility against P. fluorescens with respect to control results. Characteristic biochemical reactions of Pseudomonas species showed negative reaction in Voges-Proskauer, indole, and methyl red, hydrogen sulfide, glucose while positive reaction in catalase test. While some species i.e., P. fluorescens showed a positive oxidase test . In this study, results of biochemical reactions were showed positive reaction in arginine, cetrimide, kanamycin while negative reaction in Voges-Proskauer, arabinose, colistin, rhaminose, malonate, melibiose, nitrate, galactosidase, ornithine, raffinose, sorbitol, sucrose, and tobramycin. After biofield treatment, results showed altered biochemical reactions of arginine, cetrimide, glucose, and kanamycin. Study using different clinical isolates of Pseudomonas spp. showed that P. fluorescens did not have the capacity to grow or utilize glucose in media, proof to be a real feature of pseudomonads . Biofield treatment might cause some changes at enzymatic or metabolic pathway leading to significant phenotypic alteration in P. fluorescens, which may results in utilizing glucose in growth media. Altered biochemical reactions were results in identification of changed biotype number and species. Biotyping makes use of the pattern of metabolic activities expressed by an isolate, colonial morphology and environmental tolerances. In this experiment, biotyping was performed using automated system, results showed significant change in the biotype number with identification of new species in treated groups, and organism identified as Vibrio fluvialis with respect to control. Additionally, molecular methods were further studied to study and confirm the changes in species using 16S rDNA sequencing method. Genotypic identification methods would be expected to circumvent this change in species as evidenced by altered biochemical reactions and biotype number. Molecular assays based on 16S rDNA amplification protocol have been described. These include PCR assays and DNA amplification using standard forward and reverse 16S universal primers. 16S rDNA amplification protocol has been commonly used as a taxonomic “gold standard” in identification and determining the phylogenies of bacterial species . Selective amplification using 16S rDNA was well reported to detect and differentiate Pseudomonas species from clinical and environmental samples . Based on the BLASTn analysis, the sample 2A was identified as Pseudomonas entomophila with 96% similarity in gene sequence. The phylogenetic tree diagram (Figure 1) showed that nearest homolog species was found to be Pseudomonas fluorescens. Above results suggest that biofield treatment has significant impact on Pseudomonas species, which was well supported with 16S rDNA analysis. Thus, above results indicates that biofield treatment in lyophilized as well as revived state showed significant results in terms of improved antimicrobials sensitivity, decreased MIC, altered characteristic biochemical reactions followed by change in biotype number. Study results conclude that biofield treatment has significant and sustained effect at phenotypic level for a total duration of 174 days. Study design and results showed that alterations might occur even after storage of sample in -70°C for 159 days. This suggests that Mr. Trivedi’s unique biofield treatment has the ability to alter the antimicrobial sensitivity in treated pathogenic microbes even in the lyophilized storage condition for long duration. Bioelectromagnetic-based therapies and biofield therapies are energy therapies that use or manipulate the energy fields to promote health and healing. These energy therapies are well described under energy medicine by National Center for Complementary and Alternative Medicine (NIH/NCCAM). Biofield therapies are very popular in biomedical heath care systems . Biofield healing treatment on pathogenic strains might involve change in cell receptor protein due to electromagnetic field. Healing therapy or therapeutic touch might modify ligand-receptor interaction, which causes alteration in phenotypic characteristics . Hence, it is assumed that biofield treatment made some alteration at enzymatic or genetic level, which manifested in phenotypic alteration. Improved antimicrobial sensitivity and decreased MIC value of aztreonam, cefepime, moxifloxacin, and tetracycline in biofield treated Pseudomonas fluorescens showed significant impact of Mr. Trivedi’s biofield energy treatment. This approach can be used as a treatment approach in complementary and alternate medicine. Significant alteration in antimicrobial data was well supported with altered biochemical reactions along with biotype number. Molecular approach using standard 16S rDNA analysis showed that biofield treatment has significant impact on P. fluorescens, and sample identified as Pseudomonas entomophila with 96% identity using gene sequencing data. However, the closest homolog species was detected to be Pseudomonas fluorescens. Based on these results, it seems that Mr. Trivedi’s biofield energy treatment could be used as better alternate of existing drug therapy in future. Authors gratefully acknowledged the whole team of PD Hinduja National Hospital and MRC, Mumbai, Microbiology Lab for conduction the study and also thankful to Trivedi Science™, Trivedi Master Wellness™ and Trivedi Testimonials for their generous support in experimental works. 1. Verbist L (1993) Epidemiology and sensitivity of 8625 ICU and hematology/oncology bacterial isolates in Europe. International Study Group. Scand. J Infect Dis 91: 14-24. 2. Mandell GL, Bennett JE, Dolin R (2004) Pseudomonas aeruginosa. In Mandell, Douglas, and Bennett’s principles and practice of infectious diseases. (6thedn), Churchill Livingstone, New York, US. 3. Hsueh PR, Teng LJ, Pan HJ, Chen YC, Sun CC, et al. (1998) Outbreak of Pseudomonas fluorescens bacteremia among oncology patients. J Clin Microbiol 36: 2914-2917. 4. Palleroni NJ (1991) Present situation of the taxonomy of aerobic Pseudomonas. In: Pseudomonas molecular biology and biotechnology. American Society for Microbiology, Washington, DC. 5. Paulsen IT, Press CM, Ravel J, Kobayashi DY, Myers GS, et al. (2005) Complete genome sequence of the plant commensal Pseudomonas fluorescens Pf-5. Nat Biotechnol 23: 873-878. 7. Smith AU (1954) Effect of low temperature on living cells and tissues. Biological applications of freezing and drying. Academic Press, Inc., New York. 8. Mazur PM, Rhian MA, Mahlandt BG (1957) Survival of Pasteurella tularensis in sugar solutions after cooling and warming at sub-zero temperatures. J Bacteriol 73: 394-397. 9. Harris RJC (1954) The preservation of bacteria. Biological applications of freezing and drying. Academic Press, Inc., New York. 10. Heckly RJ (1961) Preservation of bacteria by lyophilization. Adv Appl Microbiol 3: 1-76. 11. Dhabade VV, Tallapragada RM, Trivedi MK (2009) Effect of external energy on atomic, crystalline and powder characteristics of antimony and bismuth powders. Bull Mater Sci 32: 471-479. 13. Trivedi MK, Nayak G, Patil S, Tallapragada RM, Latiyal O (2015) Studies of the atomic and crystalline characteristics of ceramic oxide nano powders after bio field treatment. Ind Eng Manage 4: 161. 18. Trivedi MK, Patil S, Shettigar H, Gangwar M, Jana S (2015) An effect of biofield treatment on multidrug-resistant Burkholderia cepacia: A multihost pathogen. J Trop Dis 3: 167. 19. Trivedi MK, Bhardwaj Y, Patil S, Shettigar H, Bulbule A (2009) Impact of an external energy on Enterococcus faecalis [ATCC-51299] in relation to antimicrobials susceptibility and biochemical reactions-an experimental study. J Accord Integr Med 5: 119-130. 20. Trivedi MK, Patil S, Shettigar H, Bairwa K, Jana S (2015) Phenotypic and biotypic characterization of Klebsiella oxytoca: An impact of biofield treatment. J Microb Biochem Technol 7: 203-206. 21. Trivedi MK, Patil S, Shettigar H, Mondal SC, Jana S (2015) Evaluation of biofield modality on viral load of Hepatitis B and C viruses. J Antivir Antiretrovir 7: 083-088. 23. Alm EW, Oerther DB, Larsen N, Sthal DA, Raskin L (1996) The oligonucleotide probe database. Appl Environ Microbiol 62: 3557-3559. 24. Kumar S, Tamura K, Nei M (2004) MEGA3: Integrated software for molecular evolutionary genetics analysis and sequence alignment. Brief Bioinform 5: 150-163. 25. Donnarumma G, Buommino E, Fusco A, Paoletti I, Auricchio L, et al. (2010) Effect of temperature on the shift of Pseudomonas fluorescens from an environmental microorganism to a potential human pathogen. Int J Immunopathol Pharmacol 23: 227-234. 26. Wong V, Levi K, Baddal B, Turton J, Boswell TC (2011) Spread of Pseudomonas fluorescens due to contaminated drinking water in a bone marrow transplant unit. J Clin Microbiol 49: 2093-2096. 27. Morgan AE (2014) The synergistic effect of gentamicin and ceftazidime against Pseudomonas fluorescens. Bioscience Horizons 7: hzu007. 28. Benito N, Mirelis B, Luz Galvez ML, Vila M, Lopez-Contreras J, et al. (2012) Outbreak of Pseudomonas fluorescens bloodstream infection in a coronary care unit. J Hosp Infect 82: 286-289. 29. Mikura S, Wada H, Okazaki M, Nakamura M, Honda K, et al. (2011) Risk factors for bacteraemia attributable to Pseudomonas aeruginosa resistant to imipenem, levofloxacin, or gentamicin. J Hosp Infect 79: 267-268. 30. Greenberg RN, Bollinger M, Compton J (1986) Synergistic activity of amikacin with aztreonam against Pseudomonas aeruginosa and other gram-negative organisms. Clin Ther 8: 354-358. 31. Zervos M, Nelson M, Bernstein J, Kernodle D, McCabe R, et al. (1998) Cefepime versus ceftriaxone for empiric treatment of hospitalized patients with community-acquired pneumonia. Antimicrob Agents Chemother 42: 729-733. 32. Stes P, Goossens H (1996) Cefepime activity against Pseudomonas aeruginosa: Evaluation of Etest and two disc diffusion methods. J Antimicrob Chemother 38: 707-711. 33. O’Brien W, Fyfe C, Grossman T, Chen C, Clark R, et al. (2012) In vitro potency of novel tetracyclines against Pseudomonas aeruginosa and other major Gram-negative pathogens. 22nd European Congress of Clinical Microbiology and Infectious Disease (ECCMID) in London, UK. 34. Rhodes ME (1959) The characterization of Pseudomonas fluorescens. J Gen Microbiol 21: 221-265. 35. Woese CR (1987) Bacterial evolution. Microbiol Rev 51: 221-271. 36. Widmer F, Seidler RJ, Gillevet PM, Watrud LS, Di Giovanni GD (1998) A highly selective PCR protocol for detecting 16S rRNA genes of the genus Pseudomonas (sensu stricto) in environmental samples. Appl Environ Microbiol 64: 2545-2553. 37. Clarke TC, Black LI, Stussman BJ, Barnes PM, Nahin RL (2015) Trends in the use of complementary health approaches among adults: Unites States, 2002-2012. National health statistics reports; No 79. Hyattsville, MD: National Center for Health Statistics. 38. Hintz KJ, Yount GL, Kadar I, Schwartz G, Hammerschlag R, et al. (2003) Bioenergy definitions and research guidelines. Altern Ther Health Med 9: 13-30.